Horoscopes are my safe space. When every day was a bad day at age 16, I would come home from school and sandwich my body on my bed while simultaneously opening up a horoscope app. It was my post-school snack and I was always ravenous. In college, after my first class of the day, you could find me leaning precariously on my dorm room desk chair (the stars said nothing about an ER visit) while fixated on what was in store for Aquarius. I’ve completely and comprehensively injected zodiac signs into my life — I happily analyze loved ones’ behaviors based on their sign, fall prey to astrologically themed merch, and even started HelloGiggles’ zodiac column way back when. As someone who aches for the stars and their tellings, I find myself drawn to astrology in all of its forms — yes, even on Twitter. That brought me to “sorrow-scopes,” a Twitter account that puts a pessimistic spin on the 12 zodiac signs. Sagittarius: Even when you dance like no one is watching, everyone is. Torches in hand, they will ensure you learn the steps...or else. Though @sorrowscopes claims that things are terrible, their content is anything but. Amid a sea of horoscopes reading “things will get better” and “reach out to your loved ones,” sorrowscopes is going for the gut. As in, their tweets will delight you with dark humor while punching you in the gut. These aren’t your mom’s horoscopes. Gemini: You'll misplace your keys and later find them in the last place you look--behind the gateway to hell. Aries: Are you even trying? 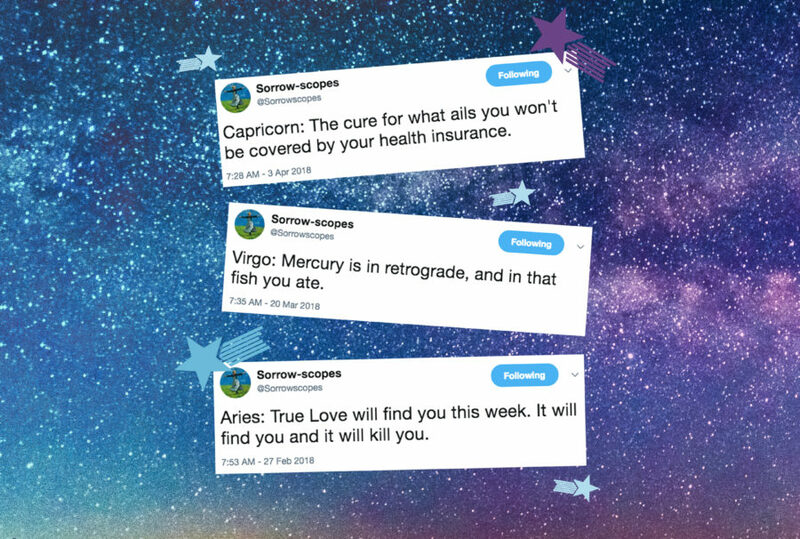 "I would describe the account as a pessimistic and sometimes insulting twist on astrology," Viktor Winetrout, who's in charge of the account, tells HelloGiggles. "It’s all in fun, of course, but we tend to joke about the darker aspects of life. Our followers are very engaged, and write great replies. That interaction is one of my favorite things about the account." Capricorn: The cure for what ails you won't be covered by your health insurance. Cancer: You'll probably want to make some quiet time for yourself today so you can reconnect with the old, dried up plant you let die on your window sill. As for the future of @sorrowscopes? "We’ve invited an equal mixture of men and women to write for us, but for whatever reason, a higher percentage of men have chosen to participate," Winetrout states. "A lot of our best writers are women, so I hope that changes. We’re working on it. In terms of content, our followers can expect more of the same. Whether they like it or not!" Aquarius: This week you'll achieve some measure of fame when you’re eaten alive by vegetarians, just for being so annoying. Sorrow-scopes are here to stay — whether you like it or not.